I've decided to move up the version number since a lot has been added and it's as good as completely up to date with vanilla. As Cosmoteer 0.14.5 is coming soon this release is in a way a savepoint before compatibility changes are made. As Cosmoteer 0.14.4 still has a few critical bugs not all new parts are fully implemented as intended but work just fine. They only miss some higher level funcationality and more detailed tweaking. You won't notice much of a different except they won't crash. It appears ammostorage and swapping crashes have returned or were not quite fiexd yet. This causes crashes upon death with supply corridors. A bunch of other crashing issues have been avoided / removed for now but do exist. New universal accelerator based weapons systems based on vanilla railgun. Developed into two main line of weapons types based on certain properties. See example post details (coming soon). Previous relevant release notes 0.5.3RC1, RC1.2, RC2, RC3, RC3.7, RC4. Download(2019 February 11 ) Not Compatible with Cosmoteer 0.14.3! Lafiel Yes! I can run SW:ACD with ABH now! Also, question: Why did you add all those decals? Found a last minute change issue causing a crash. Fixed and updated. Sorry about that. Two base accelerator types but different loader / emitter combos. A minor malfunction on the left that kind of looks nice. Also thanks to Chank aka @darkwyvrenD for the wiggle shader. Lafiel What weapon is that? Small, medium and large antimatter tanks explode in the same way. It's really stressful. especially when I have a small boat explodes a huge explosion. Can you do something about it? Zetsubou_altist That's already been adjusted last year, they use the same graphics but the start sizes are different. I can only reduce it a bit more but this probably won't change anything because of the way the game mechanics works. Zetsubou_altist Yes, but it won't look quite the same because they have to be black & white. Also many of the above have watermarks and need be reduced to their basic pattern size. 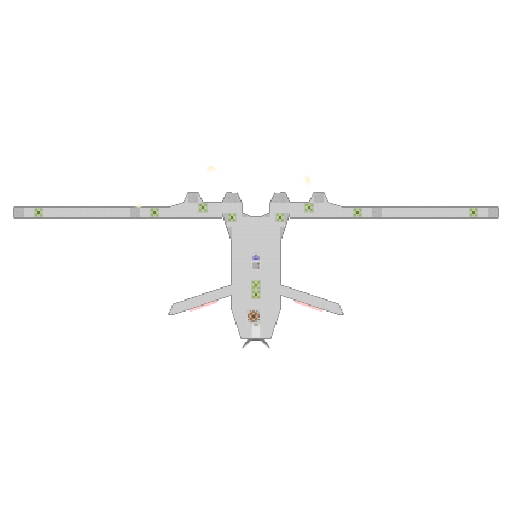 I'm working on new ones for the transformation mod because it's more fighter aircraft specific. Zetsubou_altist The health value has nothing to do with how good the armor is or the technology involved. Tech 5 armor is virtually indestructible but with a fatal weakness that can be exploited. They are usually better than google translation. I noticed that there is a problem in the strength of the fifth level armor. It's worth a lot of strength but it is less than the fourth level. All also apologize for my English (for Google translator). I hope in my speech did not sound rude. 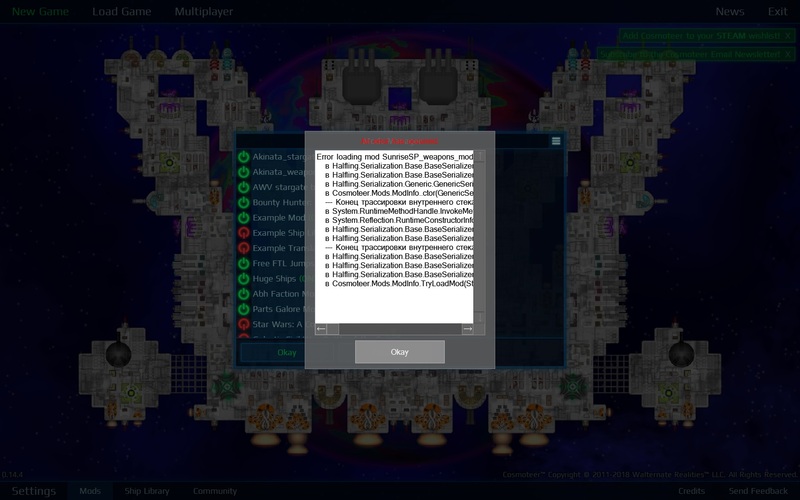 I got this error when I tried to put the mod into Cosmoteer. Boiled_Cabbage Looks like the zip file is corrupted. Try downloading it again. You can use Winrar to check the file. If the file is alright but Cosmoteer has trouble you can manually unpack it. Either allow Winrar to unpack in a new folder (which usually has the same file name as the package) or you have to create the Abh mod folder first in the mods folder found at users/username/Documents/My Games/Cosmoteer/Mods/ and then unpack everything inside into the folder. The result should have mod.txt found right inside the Abh mod folder. The package structure must be kept as is. Orz Sure, I see no problem with customizing which parts you want to use. xProBomb Those are 3 different weapons found in Tech 4. 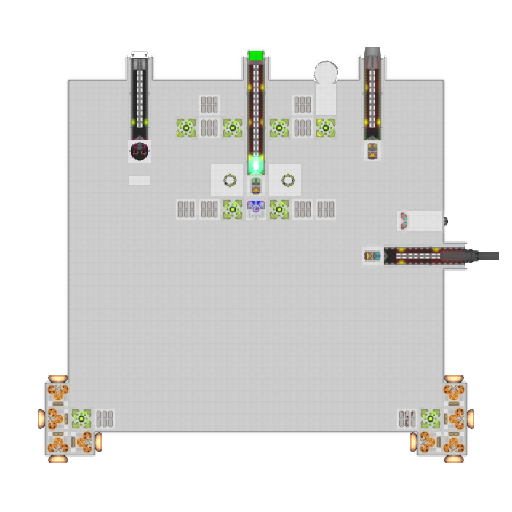 I've used the same naming convention as the railgun so it will be easier to understand roughly how to build it. See the example ships posted above and read the description. 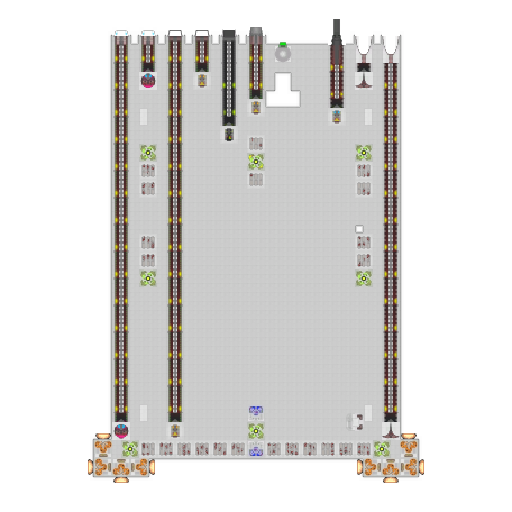 Their connecting counter parts have to be at certain positions (with one tile space of leeway). Very resistant but not that extreme and currently only at half capability as explained in the release notes. ABH now have a biological parts. Now I can make a zerg fleet in Cosmoteer! Lafiel So um, say, if i wanted to make ABH compatible with SW:ACD on my own, what would i need to do? Bevan So i tried what you suggested and replaced the mod.txt, but abh is still crashing when loaded with SW:ACD. It isn't a load time error, it's an error in code. RedAndCosmoteer Except for those listed in the release notes most of the problems are in SW:ACD v.0.3.0. Currently, it's getting updated so it's not worth it to do anything on my end. Besides Cosmoteer 0.14.5 comes with tonnes of changes so I won't invest in any changes now especially since the prototypes are buggy and things change constantly. slava_v I need the whole text file to see where the problem is. I'm guessing it's because of too many mods or one of them is outdated.